The best way to deal with a spill is to stop it before it even happens. If that’s not possible, provide spill containment at the source, so that it cannot spread into the environment. Spills of oil and hazardous chemicals spread quickly, especially when they reach water. Even a small amount of oil will cover a large water surface area. Oil spreads to less than one-tenth of an inch thickness. A one gallon spill of oil will cover more than 40 square feet of water. Therefore, implementing proper measures of secondary containment is crucial. 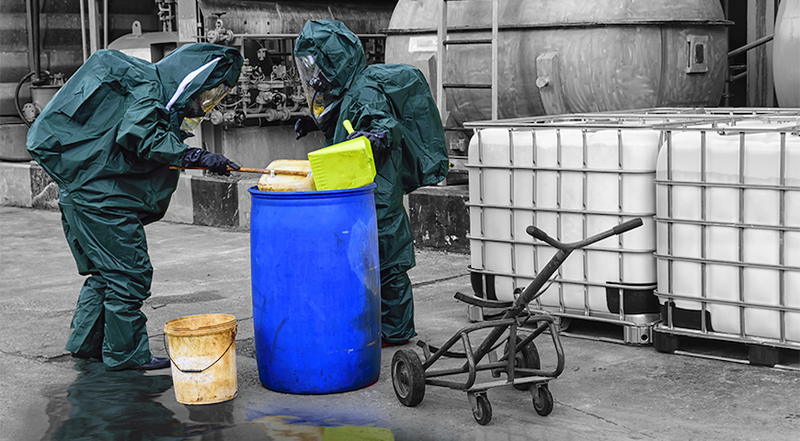 Regularly inspect all containers - drums, totes and smaller containers. This will help identify pinhole leaks before a major container rupture occurs. Daily or weekly check sheets help to delegate responsibility and make sure that everyone plays their part to minimize spills. The use of secondary containment systems prevents a spill from spreading beyond a specified area. It should surround one or more primary storage containers to collect spillage in case of a failure. Use spill containment pallets to store drums or totes. They have built-in sections to contain spills. Accumulation centers are ideal for drum filling and dispensing. Built-in secondary containment captures spills. Place leaking drums inside a drum collection center. It has enough volume to capture the entire contents of the drum. Drum management stackers keep stacked drums secure and capture leaks. They provide integrated spill containment trays for dispensing. Place safety spill trays underneath faucets when transferring product from a drum or tote. They should also be used underneath drums on open racks and for mixing operations. Storing batteries, paint cans, washing pails and oily small equipment parts on spill trays keeps surfaces clean. Store drums and totes in approved storage rooms, outdoor drum sheds or lockers. NFPA and OSHA standards regulate storage requirements for different applications. A spill containment caddy makes it easy to move a drum, while capturing any oil or chemical splash. Equipment and accessories for storing and dispensing flammable liquids should meet regulatory standards. Safety faucets are self-closing and have drip proof replaceable seals. Safety drum vents maintain a constant pressure in the drum. They provide vacuum relief when drawing liquids out and emergency pressure venting in the case of a fire or excessive heat. Spill control funnels are designed to facilitate waste disposal. Their low profile enables quick liquid collection or passive draining. Having the right equipment to prevent and contain spills is a good starting point. Yet, many spills occur due to inadequate procedures, poor training of employees and lack of supervision. Regularly update procedures and work instructions to ensure everyone is up to date with equipment in use and the operating context. Train employees on how to use spill prevention equipment. Supervise activities to keep the workplace safe and environmentally friendly. Justrite supplies spill prevention and containment solutions equipment, storage cabinets and accessories. Qualified personnel will advise you regarding regulatory codes that affect your business and the best solution for your needs.